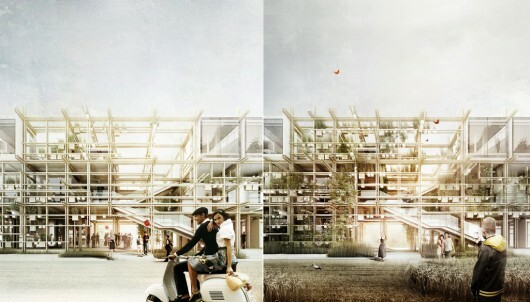 In an effort to “feed the world,” Penda, in collaboration with Alex Daxboeck, has won first runner-up in the two-stage competition for the Austrian Pavilion at the 2015 Milan Expo. 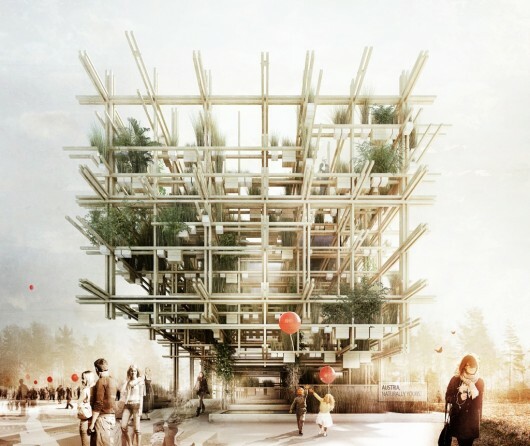 Supporting the Expo’s theme, penda’s proposal plans to be designed and harvested by its visitors, who will plant herbs, vegetables and fruits all over it throughout the duration of the seven-month event. By the end of the Expo, the pavilion will be fully taken over by organic food, which will then be prepared by chefs and served back to the visitors in the Pavilion-Restaurant 1). 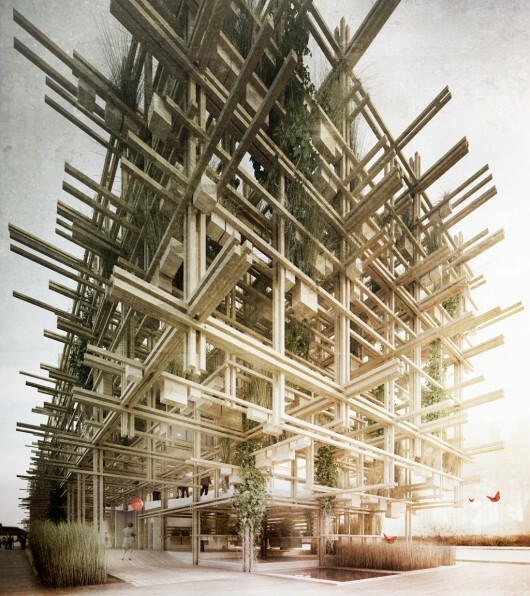 During the summer months of the Expo, visitors are asked to fill the gaps between the timber structure with seeds of vegetables, fruits or herbs. As a design principle, the structure is just a frame for ‘home-grown’ food and the visitors are the main designers decorating the pavilion with plants of their choosing. Therefore the guests get a pot at the entrance, then they turn onto an exhibition ramp of 820sqm – partly outside, partly inside – constantly surrounded by the main structure. On this exhibition ramp local plants and seeds are shown to the visitors and they are given an understanding of the lifecycle of plants and the passion of people who are involved in the process. The visitors get a closer insight of how our food gets seeded and treated while it grows, how it gets picked and harvested and how the ingredients get combined for traditional Austrian cuisine, wine or schnaps. That it does matter what we eat should be the main message of the exhibition to bring to the visitors mind 2). The ramp will end at the restaurant, where all vegetables, fruits and herbs planted by the visitors will be prepared by the kitchen into traditional Austrian dishes.